We have developed a novel method to quantitatively analyze mitochondrial positioning in three dimensions. Using this method, we compared the relative positioning of mitochondria in adult rat and rainbow trout (Oncorhynchus mykiss) ventricular myocytes. Energetic data suggest that trout, in contrast to the rat, have two subpopulations of mitochondria in their cardiomyocytes. Therefore, we speculated whether trout cardiomyocytes exhibit two types of mitochondrial patterns. Stacks of confocal images of mitochondria were acquired in live cardiomyocytes. The images were processed and mitochondrial centers were detected automatically. 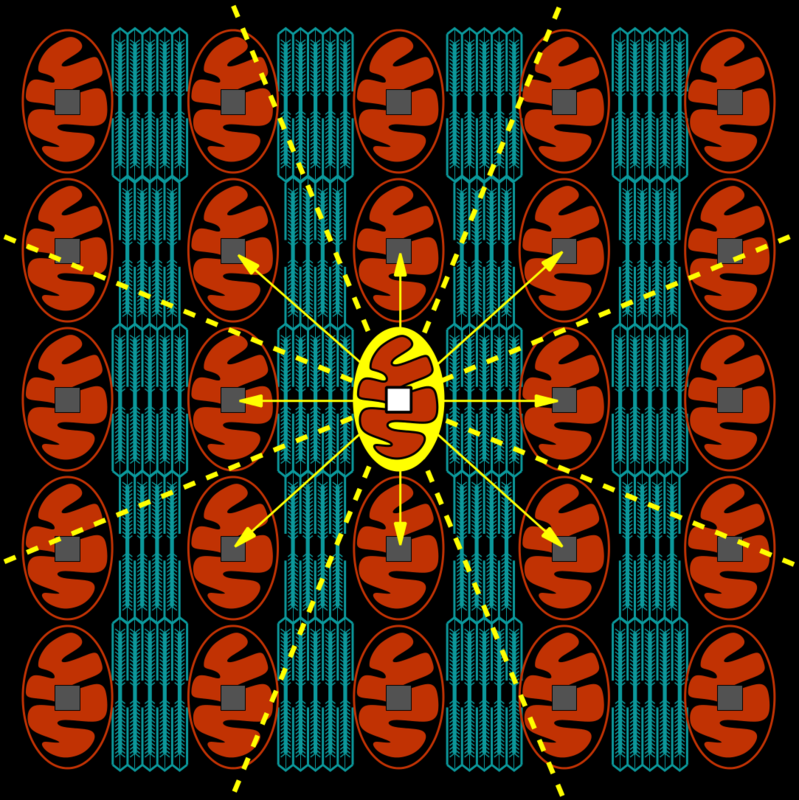 The mitochondrial arrangement was analyzed by calculating the three-dimensional probability density and distribution functions describing the distances between neighboring mitochondrial centers. In the rat (8 cells with a total of 7,546 mitochondrial centers), intermyofibrillar mitochondria are highly ordered and arranged in parallel strands. These strands are separated by approximately 1.8 mum and can be found in any transversal direction relative to each other. Neighboring strands exhibit the same mitochondrial periodicity. In contrast to the rat, trout ventricular myocytes (22 cells; 5,528 mitochondrial centers) exhibit a relatively chaotic mitochondrial pattern. 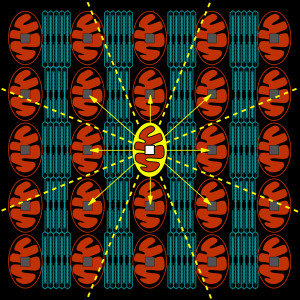 Neighboring mitochondria can be found in any direction relative to each other. Thus, two potential subpopulations of mitochondria in trout are not distinguishable by their pattern. The developed method required minor interaction in the filtering of the mitochondrial centers. It is therefore a practical approach to describe intracellular organization and may also be used for analysis of time-dependent organizational changes. The obtained quantitative description of mitochondrial organization is a requisite for accurate mathematical analysis of mitochondrial systems biology.